A second successive defeat wasn't what Clyde boss Barry Ferguson was looking for. Two goals for Montrose late in the second half ruined Clyde’s hopes of picking themselves up after last weekend’s home defeat. The Bully Wee dropped off in the second half as Montrose took their opportunities to score - Graham Webster and Gary Fraser both finding the net in the last 15 minutes. Both sides had their share of chances in the first half. The home side took their first opportunity 13 minutes in when a Paul Watson shot from inside the box was palmed away by John Gibson for Ross Campbell to hit the woodwork on the rebound. Sean Higgins fired high and wide from deep on the left for Clyde just before the 20 minute mark. Two minutes later David Marsh headed straight to Montrose keeper Jordan Millar. Clyde continued to press with Scott Ferguson forcing a corner that was taken by Chris Mitchell who fired into the box to be nodded over by Chris Smith. On the half hour Bolochoweckyj picked up a booking for Clyde for a foul on Ross Campbell. Ross McCord stepped up to take the free kick that Graham Webster played back across goal to Gary Fraser whose shot was tipped past the post by Gibson. In the closing stages of the half Webster fired over the bar from 20 yards while an Archie Campbell effort from just outside the box went straight to the Montrose keeper. Higgins picked up Clyde’s second booking, for dissent, early in the second half. Montrose were awarded a penalty early in the half when Bolochoweckyj brought down McCord in the box. Gable Endies skipper Paul Watson stepped up to take the shot that was palmed safe by Gibson. In a scrappy second half Marsh picked up another booking for Clyde for a foul on McCord. Minutes later Andrew Steeves picked up Montrose’s first booking for holding back Ferguson. Mitchell stepped up to take the free kick that bounced clear. In the 65th minute Campbell sent the ball well over the bar from the centre of the box in Montrose’s first clear cut chance of the half. Good work from Scott Johnston minutes later saw him cross into the box to be cleared by Scott Linton. A Ferguson long range effort sailed over the bar in a good opportunity for the visitors. 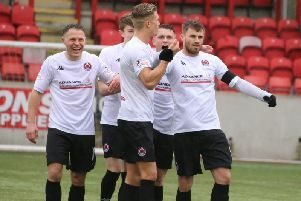 With just under 20 minutes to go Scott McLaughlin fired a Clyde free kick well over the bar. Montrose eventually broke the deadlock in the 77th minute when Graham Webster lashed in from the box. Minutes later Fraser’s long low ball from outside the box rolled straight past Gibson to make it 2-0. With Clyde desperate to claw back a goal a Gormley effort in the closing minutes was saved well by Millar. Bolochoweckyj was next to send the ball past the post. MONTROSE: Millar, Ferguson, Steeves, McCord, Pascazio, Allan, Johnston, Watson, Fraser, Campbell (67 - Milne), Webster. Subs unused: Masson, Reoch, Kenneth, Reid, Trialist, Salmon. CLYDE: Gibson, Linton, Bolochoweckyj, Smith, McLaughin, Campbell (77 - McQueen), Gormley, Higgins, Marsh, Mitchell, Ferguson. Subs unused: Brisbane, Tobb, Fisher, Lynass, Roberts, McMillan.